Volume I: 12 chapters including the chironomid life cycle, equipment, leaders & their construction, selecting the right strike indicator, selecting the right fly and more. 70 min. Chironomids or midges are undoubtedly the most prolific & prolonged insect emergence found in productive stillwaters. Trout, char & other game fish take advantage of this abundant easily captured food source. Emergences can last from a few months during the spring & early summer period to yearlong hatches. Understanding & mastering this important food source not only increases the numbers of fish you catch but provides the satisfaction of understanding why you are being so successful. The special features section of the DVD offers a selection of Phil and Brian's proven larva and pupa patterns with tying recipes and important knots including two versions of the non-slip loop knot. This this video is packed with information that will significantly shorten the learning curve of conquering chironomid fishing. Once hooked on chironomid fishing it will become an obsession! 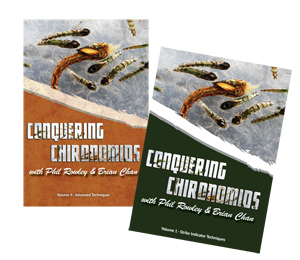 Building on the concepts detailed in volume I, this will take your mastery of chironomids to the next level. Phil and Brian invite you to continue your educational journey as they reveal their advanced chironomid tactics, tricks and presentation techniques. The special features section includes recipes and images of some of their favorite larva, pupa, emerger and adult patterns, how to maintain your reel, how to use and incorporate sounders into your Stillwater presentations and much more.